Scientists are beginning to understand one of life’s enduring mysteries – why women live, on average, longer than men. Published today in Current Biology, research led by Monash University describes how mutations to the DNA of the mitochondria can account for differences in the life expectancy of males and females. Mitochondria, which exist in almost all animal cells, are vital for life because they convert our food into the energy that powers the body. 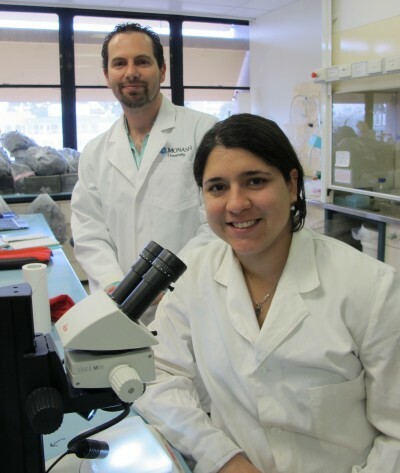 Dr Damian Dowling and PhD student, Florencia Camus, both from the Monash School of Biological Sciences, worked with Dr David Clancy from Lancaster University to uncover differences in longevity and biological ageing across male and female fruit flies that carried mitochondria of different origins. They found that genetic variation across these mitochondria were reliable predictors of life expectancy in males, but not in females. Dr Dowling said the results point to numerous mutations within mitochondrial DNA that affect how long males live, and the speed at which they age. “Intriguingly, these same mutations have no effects on patterns of ageing in females. They only affect males,” Dr Dowling said. The researchers said these mutations can be entirely attributed to a quirk in the way that mitochondrial genes are passed down from parents to offspring. “While children receive copies of most of their genes from both their mothers and fathers, they only receive mitochondrial genes from their mothers. This means that evolution’s quality control process, known as natural selection, only screens the quality of mitochondrial genes in mothers,” Dr Dowling said. The study builds on previous findings by Dr Dowling and his team that investigated the consequences of maternal inheritance of mitochondria in causing male infertility. “Together, our research shows that the mitochondria are hotspots for mutations affecting male health. What we seek to do now is investigate the genetic mechanisms that males might arm themselves with to nullify the effects of these harmful mutations and remain healthy,” Dr Dowling said.